Leizhan innovative paper pulping solutions can highly improve the efficiency and performance of paper making project of paper plants. Hydrapulper machine like ZDSZ Series M.C. Hydrapulper, ZDSG H.C. Hydrapulper, ZDS Series Vertical Hydrapulper is specially designed by Leizhan professional engineer to improve the paper pulping effect and lower investment cost for paper producer. ZDSZ Series M.C. 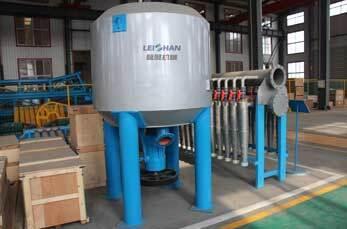 Hydrapulper can be used for pulping virgin pulp and some other clean paper making materials. It has the benefits of high efficiency, good pulping effect, energy saving. ZDSZ Series M.C. Hydrapulper is a good choice for paper plant. 2. Capacity: production capacity can exceed 800t/d. 3. Energy-saving S type rotor. ZDSG H.C. Hydrapulper is mainly used for decomposing recycled paper and waste paper deinking under high consistency. ZDSG H.C. Hydrapulper can gentle pulp waste paper under high consistency and has a good pulping effect. 2. Production capacity: up to 260 tons per day. 3. Good fiber relief and deinking effect. ZDS Series Vertical Hydrapulper is used for pulping paperboard, broke paper and waste paper, etc. It can be used for continuously pulping and fiber relief. ZDS Series Vertical Hydrapulper has the advantages of energy-saving VOKES rotor and low power consumption. 1. It is suitable for various raw materials. 2. Applies to energy-saving VOKES rotor strengthens hydraulic circulation. 3. Excellent pulping effect, low energy consumption.